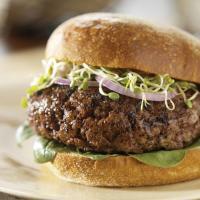 Make the best burgers this summer with Topline Foods organic ground beef and all natural ground buffalo! Topline Foods offers organic, grass fed ground beef and all natural, grass fed buffalo to make your summer grilling delicious! And, with our nationwide home delivery including the greater Phoenix metro area it couldn’t be more convenient. Quality, convenience, value – Delivered! This entry was written by jeff, posted on May 13, 2011 at 1:39 pm, filed under Blog, Grass Fed Beef and tagged all natural beef, antibiotic free, Arizona, Arizona organic grass fed beef, grass fed beef, home delivery, organic beef, Phoenix, Phoenix organic grass fed beef, Scottsdale organic grass fed beef, where to get organic meat. Bookmark the permalink. Follow any comments here with the RSS feed for this post. Both comments and trackbacks are currently closed. Oh my goodness you have ground buffalo! I had no idea, that’s a staple in this house! We will be adding it to our next purchase, it’s got so much flavor we prefer it to beef all day long! You keep getting better and better~ is that possible?! Thank you for such good stuff!